It would be remiss to go to the fully restored, working Victorian Middleport Pottery and not have a cuppa. 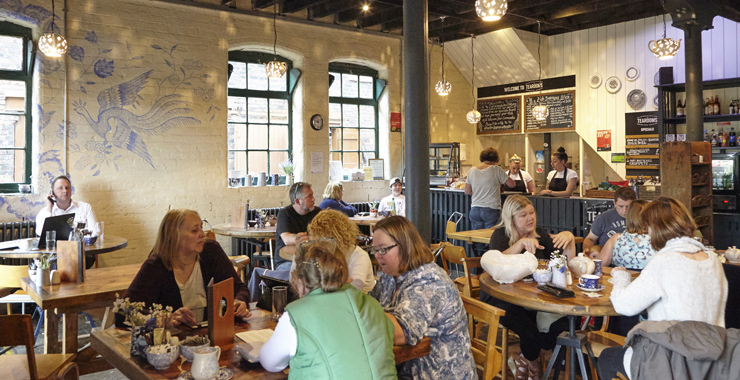 Located in this historic pottery in Staffordshire, The Tearoom Middleport is the perfect place to enjoy a reflective cup of tea. But if tea isn’t your thing, don’t worry – we also have delicious artisan coffee, juice and soft drinks. We also offer freshly made breakfast and lunch, as well as tempting cake and cream teas with lashings of jam and cream. Plus, a tasty selection of vegetarian and gluten-free options are available too. Enjoy your food and drink inside, beside the wood-burning stove, while admiring murals by local artist Joyce Iwaszko. Or take a seat outside and watch the narrow boats in this historic part of Staffordshire. As ever, our staff will be there to welcome and serve you in Totally Delicious style.